Ever since the journey of "missionaryhood" began for us (over 14 years ago now) we've been asked questions many times, in many ways, that all boil down to this: Why? Why do you want to live overseas? Why would you choose to forsake the salary of a doctor in the States? Why would you choose to raise your kids in a different culture? Why would you choose to live there all the time, instead of just visiting? Why do you want to serve overseas when there are so many needs here in the States? So why do we do this? The short answer: Because God asked us to and we chose to obey, and because we believe that serving the poor is close to the heart of God, and because Africa as a whole suffers from the least amount of doctors per person than anywhere else in the world. 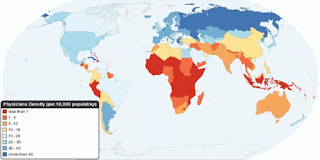 Check out this map from the World Health Organization. Countries in red have less than 1 physician per 10,000 people. This has been continually convicting us to keep doing what we're doing. In short, God asked us to go and meet a need for healing people in Africa. We said yes. That's really all there is to it. The long answer includes things like Jesus saying, "When you enter a town and are welcomed, eat what is set before you. Heal the sick who are there and tell them, 'The kingdom of God is near you.' " (Luke 10:8-9). It also includes things like the Lord saying to Moses, "I have indeed seen the misery of my people in Egypt. I have heard them crying out because of their slave drivers, and I am concerned about their suffering. So I have come down to rescue them from the hand of the Egyptians" (Exodus 3:7-8) and then the Lord packing a punch when He said, "So now, GO. I am sending YOU to Pharaoh to bring my people the Israelites out of Egypt" (Exodus 3:10, emphasis mine). The long answer includes us recognizing that, often, God desires to use His people to be the answer to prayers and cries for help. It includes knowing the heart of God, which breaks for those who are sick and suffering, and knowing that He calls His own and equips His own to bring comfort and healing. The long answer includes obedience and determination, continually confirming that we're still on track with His plan for our life, and commitment and joy to be in His service. If you want the longest version to why we do what we do, give us a call and we'll tell you in person!